Being a quality pitcher is a lot much more than simply catching a pitched ball and returning it to the pitcher. You must also be strong enough and prepared for the physical demands of the sport. 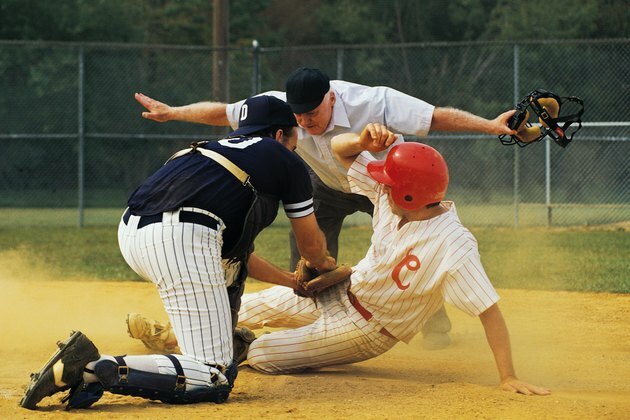 During the course of a game catchers squat and stand over 100 times, throw out base runners who try to steal second base, block wild pitches and block the plate from a base runner trying to score. A workout program designed to improve your strength and agility can help you play your position effectively. Squats are an exercise that builds leg power, which catchers need during a game, and to endure a full season behind the plate. Squats can be performed while holding a barbell across your upper back, with dumbbells at your sides or with just your own body weight. To perform a squat, stand with your feet about shoulder-width apart and bend your legs until your thighs are about parallel to the floor. Do a lower number of repetitions with heavier weight to build power and size, and higher reps with lower weight or your body weight for strength and endurance. Side lunges will help strengthen the muscles a catcher needs for lateral movement. Pitches to either side in the dirt must be blocked, and quick lateral movement is the key to getting in front of a wild pitch. Stand with your hands on your hips, or a dumbbell in each hand, then step out to either side into a lunge. At this point, you can step back to the start with your lunging leg or step up with your straight leg and continue in that direction. Perform an equal number of reps on each side. Footwork is an important aspect of being a catcher. Blocking pitches and pivoting to throw out base runners requires you to be quick on your feet. Incorporating rope jumping into your workout routine will help increase foot speed and coordination. Practice jumping with both feet on the ground at once and with different combinations of one foot. Lower-body plyometrics refers to jump training, and it is an effective way to build explosive leg power. You can perform lower-body plyometrics by simply crouching down and jumping as high as you can over and over, or you can create specific exercises. Jumping up onto a bench and down is one effective move, as is performing a half-body turn each time you jump. Upper-body plyometrics will strengthen your arms and shoulders, which helps keep your arm strong for all the throwing a catcher has to do. Using a medicine ball, perform explosive throwing movements with both hands, using your arms and legs to generate power. Throw the medicine ball overhead against a wall, to the side against a wall, up and over your head and slam it down into the ground. You can also perform plyometric push-ups by exploding up off the floor in the middle of each repetition.